The highlight of the festival is the unrolling of the thondrol of Guru Rinpoche on the last day. This huge embroidered tapestry, shown only one day a year, is not allowed to be struck by the direct rays of the sun. It is unfurled at around 3:00 in the morning and rolled back up by 7:30. 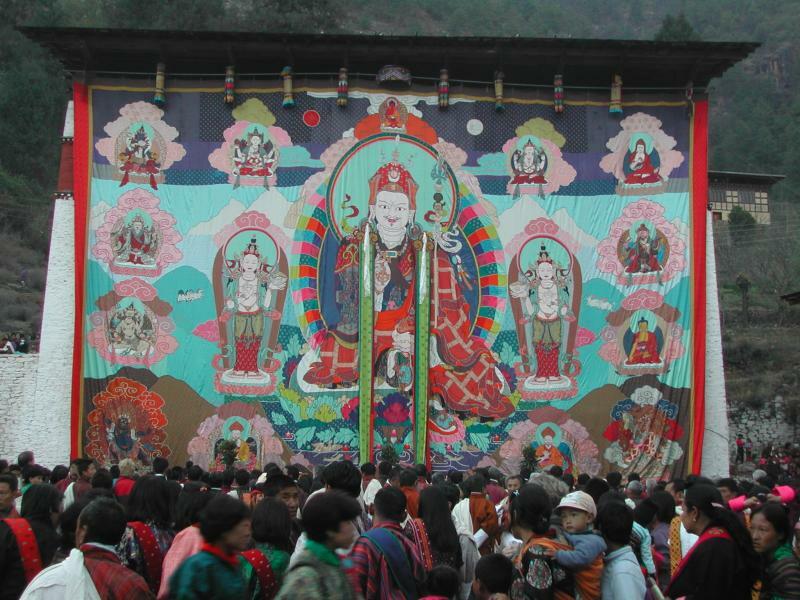 The thondrol and, in fact, the entire tsechu celebrates the teachings and events in the life of Guru Rinpoche (in India: Padmasambhava). Although Buddhism had come to Bhutan before Guru Rinpoche's visit in 746, his missionary work throughout the Himalayan kingdoms did much to popularize and spread the religion, and, in particular, the Nyingma (the so-called "red hat") sect.